We're not a big fan of Celebrity Duets to start with. But when we saw the line up and noticed that Carlene Aguilar is indeed one of the contestants, our viewership on a swayed. We've always been a fan of Carlene Aguilar since she became the representative to the 2005 Miss World Beauty Pageant. Until the news broke out that she was pregnated by no other than Dennis Trillo. But I think it was more of a blessing coz after she gave birth, she had more exposures than before. Her Bench Blackout Underwear Show participation was jaw dropping. Surprising how she quickly recover her figure. Let's support Carlene Aguilar on Celebrity Duets so that we can have more time with her. Carlene won the title of Miss Philippines Earth and became the country's first representative to the 2001 Miss Earth pageant. In 2004, she became Miss Chinatown Manila and Miss Chinese International 2nd Runner-up. 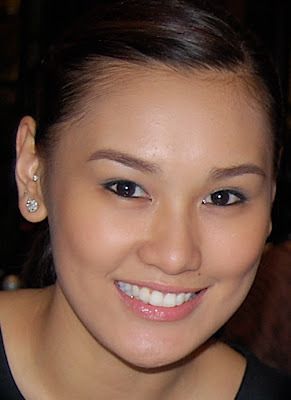 In 2005, at the Binibining Pilipinas pageant she was crowned as Binibining Pilipinas World. She was also named as Miss Philippine Airlines and Miss Avon. She was a semi-finalist and a favorite by the bookmakers and pageant sites at the 2005 Miss World pageant in Sanya, China.